Gas heating is an effective and environmentally sound way to heat your home. Natural Gas is a safe and efficient energy source that has been used in Australia for commercial purposes for more than 100 years. Many people prefer gas heating to air conditioning; the instant warmth or the look of a gas fire can be very attractive on a cold winter’s day! 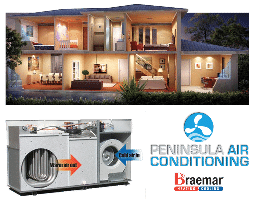 Here at Peninsula Air Conditioning we offer ducted gas heating and flued gas heaters from Braemar. You can check on the availability of natural gas for your home on the Natural Choice website here. Ducted gas heating is a very popular heating method at the moment. There are choices of multiple zones and/or controllers to really customise a solution exactly the way you want it, including individual temperature controlled zones.